At the beginning of July I spent 10 days in the north of Spain. I started in Barcelona and went via Pamplona, Logrono and San Sebastian to Madrid. As this is a food blog, I'll concentrate on the highlights of all the delicious food I had, but some of the sights were spectacular too. So as I said I started the trip in Barcelona with a Jamon Iberico de Bellota Salad. This ham is from pigs that have only been fed on acorns and it is rather expensive, but oh so worth the money! It s out of this world. I loved Barcelona too, it was I think my favourite place on the trip. I love Gaudi architecture so spent the couple of days I had in Barcelona doing the highlights. The Sagrada Familia is just stunning. 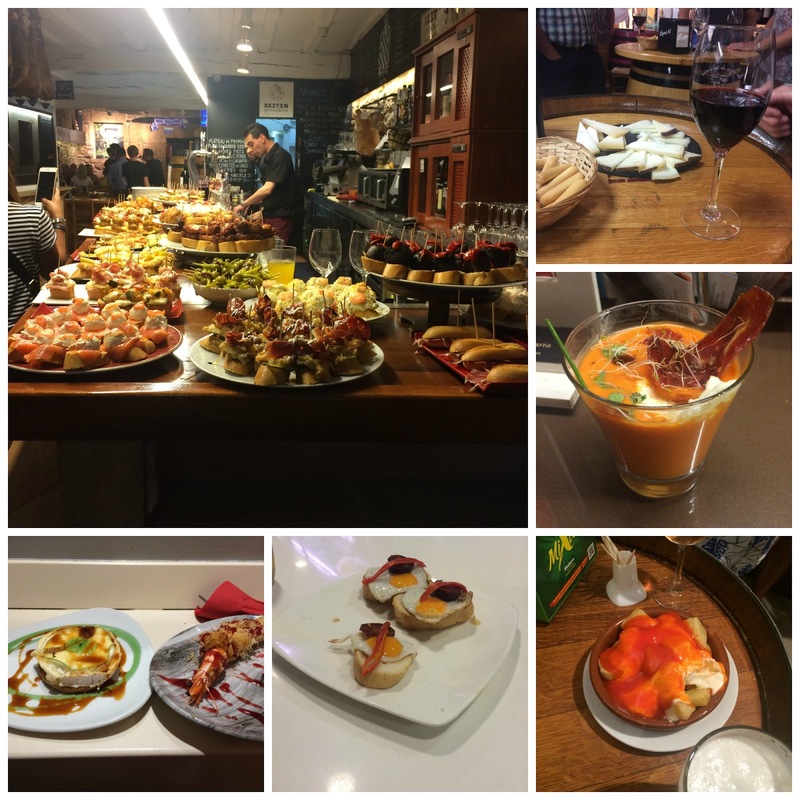 We then moved to Pamplona and went to a Basque restaurant for our first lunch. 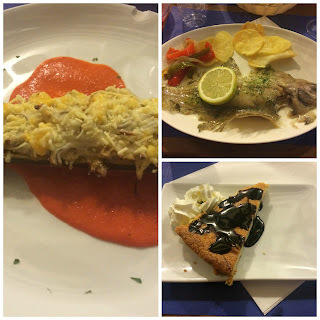 I had courgette stuffed with gulas and gambas, basically baby squid and prawns, followed by gallo or rooster fish and the Basque tart. It was all delicious. 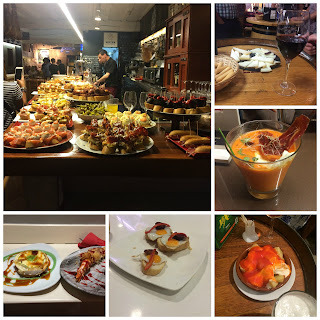 We also had a wine tasting in Logrono and although I didn't like either of the wines, too spicy for me, they were served with delicious slices of salami, which I couldn't get enough of! We also went to a Valencian restaurant in Logrono and had paella. We had both traditional and seafood. It was so good. We went to another Basque restaurant in Lescarte, just outside San Sebastian and we had a lovely first course and main and then for pudding they brought out Vienetta!! I don't think I've had this for about 20 years, it definitely conjures up memories of sleepovers as a child! There were a couple of things I really wanted to try. One was chicharon, basically pork scratchings. The other was churros. I was a bit disappointed by the churros, for whatever reason they weren't as tasty as I thought they would be and it was too hot to drink all of the chocolate, which looked so so good. I'll have to go back in winter time as I'm told that the Spanish don't eat churros in summer, now I understand why! As you may have noticed from the above pictures there was very little in the way of veg floating around and side dishes weren't commonly on the menu, so by the final weekend in Madrid I had a very unhappy tummy. So on the last night we went to a Vegetarian restaurant near the Reina Sofia Museum. I'm still not really sure what I ate but it was very tasty, full of veg and grains and it sorted my tummy right out! I enjoyed visiting Spain and I will definitely go back to Barcelona and Madrid and I also have yet to visit the south so that's on my list too! I'm a Librarian in London and I love to cook, and this is my attempt at a food blog! I love any sort of food and trying out new things, but tend to stick to simple cookery, with lovely fresh ingredients as well as a few helpful freezer items! Lemon and Cheese are my two favourite foods so expect a lot of them! Come and help me explore the food I love! Lemon and Cheese © 2008-2014 All rights reserved. The content of this website is license under the Creative Commons Attribution-Noncommercial-No Derivative Works 3.0. To reference recipes and photos, please credit and link back to Lemon and Cheese.